I know, the background in this character is pretty dark. But he's life, he's house, but he is grow up in a cold and hard family, so i haven't choice. Very good picture, showing the tragedy of his life. Love how you included Kreacher! Cool picture of a very cool character! 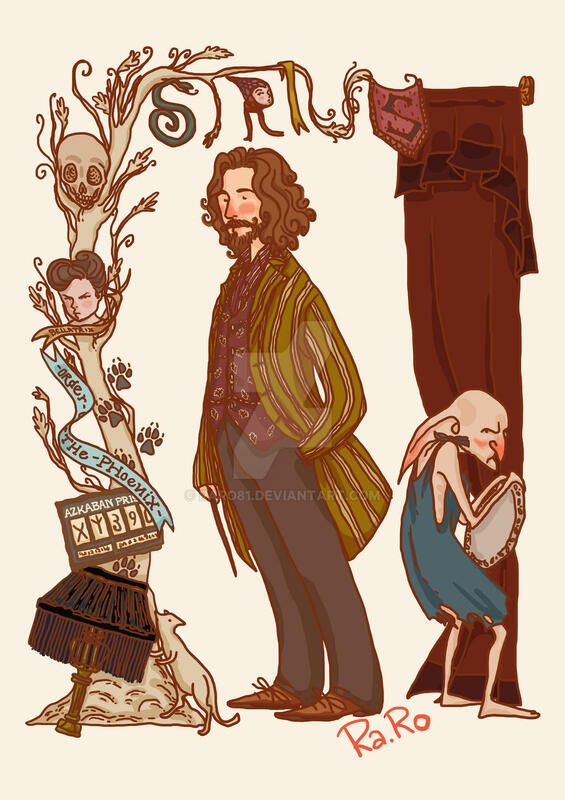 Yay Sirius Black! Or is it Stubby Boardman?? That was "The Quibbler's" theory: Sirius Black is actually Stubby Boardman, who was the leadsinger of the band "Hobgoblins"
Ah yes, I hate it when they change such things as names. In germany Hermione is called "Hermine" (which I find quite annoying). You are able to grasp the essence of the character! Bright Dark Star Sirius. Thank you very much, I am very glad that the courage to come to see you with your request! All you illustrations for the book series of the "Harry Potter" create a harmonious picture so that I would gladly bought a book with this design. ah, I was wrong address))) I'm in the wrong place written reply. All the illustrations, drawn by you to the book series "Harry Potter" create a harmonious world, and I am pleased to have bought a book with such a concept design. Fans Potteriana certainly would like to find these images on the covers of books. I have no doubt that they would have enjoyed the love of readers. I would be happy to have your work included in my books. And small children and adult readers would be happy. I do not like ugly kids, who striding across book covers 17 years. No soul, no heart. Will you let me, for myself to make book jacket on the book with your images? And with your Alphabet? Great rendition of one of my favorite characters! I'm glad I came across this because I see you have many other HP pieces! I definitely did. I think I added most of your Harry Potter pieces. lol. I love them! I can't wait for more. Do you think you'll do Charlie? I loved him in the books and I was really sad they didn't show him in the movie, especially Goblet of Fire. Oh you should! The books, as usual, are so so so so so so so so so so so so much better than the movies. You'll LOVE Charlie.